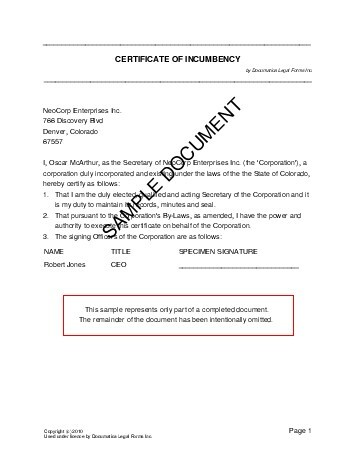 The secretary of a corporation may use a Certificate of Incumbency to formally state the corporation's signing officers, directors, and shareholders along with their signatures. Do you wish to list the signing officers? How many officers are there? Do you wish to list the directors? Do you wish to list the shareholders? How many shareholders are there? Do you wish to certify that the company's minute book is complete and accurate? We strongly recommend obtaining an attorney reviewed Certificate of Incumbency directly from us.